We are all probably aware that Fair Trade items are created in other countries by workers who are protected from exploitation, but true Fair Trade is so much more than this. Suppliers sponsored by the World Fair Trade Organisation have to adhere to a strict 10 principle ethical code which is constantly monitored to ensure that it is being followed at all times. These steps have been put in place to ensure that children are not being used as tools for profiteering in labour sweatshops, women can work safely in groups and with hours to suit their parental needs and that all receive a ‘Local Living Wage’ for hours worked. A Local Living Wage is received for a standard working week consisting of no more than 48 hours. This will provide an honest standard of living for the worker and her or his family. This takes into account usual living expenses as well as including provision for unexpected events. Companies are required to pay sustainable prices that don’t fall below the market price which protects the baseline wages for the producers. This is why you wouldn’t normally see official Fair Trade products in pricing wars on marketplace storefronts such as Amazon or Ebay. Working conditions are also monitored with assurances that the workplace is safe and complies, at least, with local national laws on health and safety. The environmental impact of organisations producing Fair Trade products is greatly reduced as, wherever possible, locally produced and purchased sustainably managed raw materials are used alongside production technologies that seek to reduce energy consumption, using renewable energy technologies that minimise greenhouse gas emissions, wherever possible. Within the agricultural commodity producers, environmental impacts are reduced by using organic or low pesticide use production methods wherever possible. Packaging is recycled or biodegradable as far as possible and the vast majority of goods are shipped by sea rather than flown which further reduces the environmental impact. 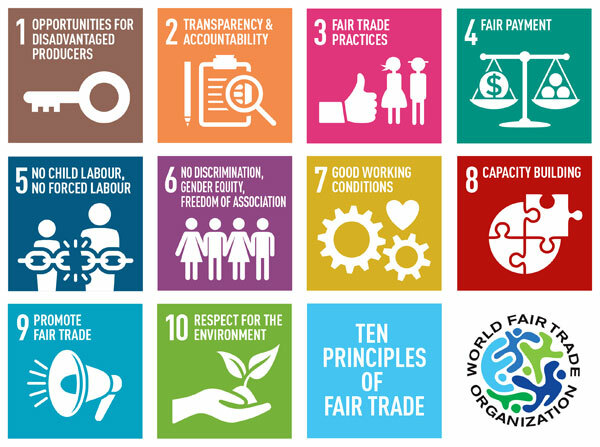 The full 10 Principles of Fair Trade can be found in its entirety here. 1) Supporting Fair Trade producers by buying their products, means you are actively helping to encourage the regeneration of small communities, allowing them to help themselves with social development projects such as the construction of schools and health centres which provide them with the infrastructure to be self-sustaining and to pull them out of poverty. 2) Encouraging gender equality by supporting the initiative of bringing women into the workplace with equal pay. 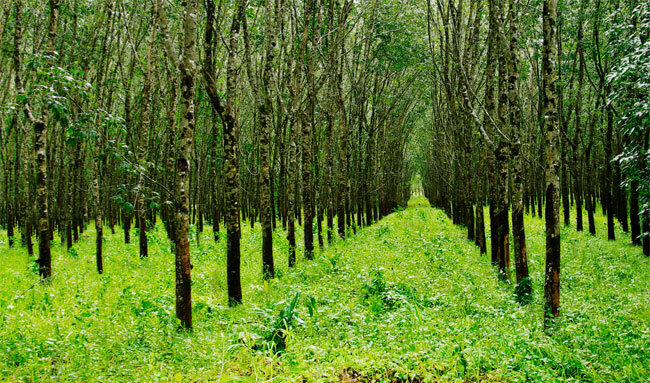 3) The use of more organic and environmentally acceptable means of production reducing the impact on the earth. 4) Fair Trade toys are usually made by hand making each piece individual. With many items, the whole process will be carried out at source, from growing the natural textiles, to the dying of fabric, right up to the creation of the finished product. Importantly all of our Fair Trade toys strictly comply with the EU toy safety standard EN 71 making them safe for the age group indicated for each particular toy. 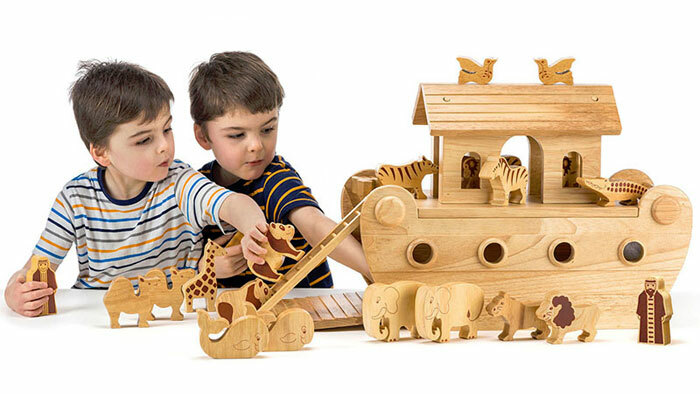 Lanka Kade supplies a variety of wooden and textile toys made in Sri Lanka. In addition to following the internationally accepted 10 Principles of Fair Trade, they expand on this with their own fair trade policy. Their complete range is made by 10 family enterprises who work closely with the designers in the UK to utilise their strengths when creating their amazing products. Lanka Kade toys usually incorporate a learning element such as counting or alphabet and encourage manual dexterity in items such as puzzles and skittles. Their dolly families are a real favourite with our customers and include all members of the family in a variety of ethnicities. Pebble toys are made in rural Bangladesh by women in a co-operative. They set their own hours and are able to carry on with their other duties such as raising families and still earn their own money for the family. Taking these co-operatives outside of sweat shops of Dhaka means that the women can take small children to work with them so they can play in a safe environment while Mum creates beautiful toys. Pebble create beautiful, colourful and imaginative crocheted soft toys by hand, which unlike knitted products, cannot be created by machine.